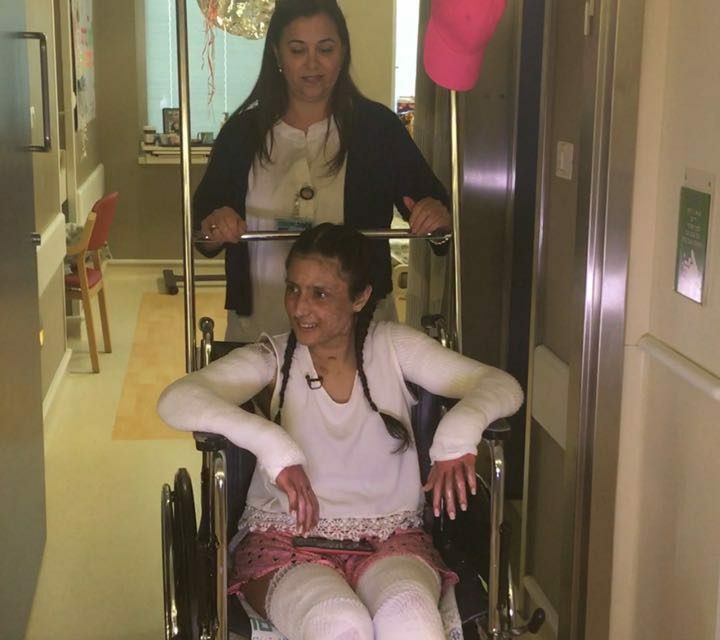 After nearly two months of remarkable care at Hadassah, Eden Dadon, the sixteen year old victim of a bus bombing has left Hadassah Hospital to begin rehabilitation. On April 19, 2016, Eden and her mother Racheli got onto the No. 12 bus near their home in the southern Jerusalem suburb of Talpiot, intending to do some shopping in the mall. It was 5:45 pm, the week before Passover, and the bus was crowded. They couldn’t sit together. Eden went to the back and her Mom took a seat closer to the front. The bus had only travelled a short distance when terrorist Abed al-Hamid Abu Srour, 19, who was sitting near Eden in the back, set off a bomb. Abu Srour, from a middle class family near Bethlehem, was a member of the West Bank Unit of Hamas. The bus caught on fire, as did two nearby vehicles. Eden was the most seriously injured of the 21 victims, (except for the terrorist who died shortly after the bombing). The ambulances rushed Eden to Hadassah Ein Kerem. Her mother Racheli, who was lightly injured in the attack, was also treated at Hadassah and remained by her daughter’s side for the long hospitalization. After initial treatment in Hadassah’s Swartz Center for Emergency Medicine trauma center, Eden was transferred to the Sarah Wetsman Davidson (SWD) Hospital Tower intensive care unit. She was on life support for two weeks before the staff began to scale back medication. The joyful news spread first through the hospital and then throughout Israel: Eden had woken up and she was communicating with her Mother. Last week, Hadassah USA arranged for Eden to get a bedside manicure. Read an earlier article about the bus bombing.